BAseball Reality Tour: Backe's Back! Just a quick shout out to Brandon Backe, making his first start of the season for the Astros in a few minutes. 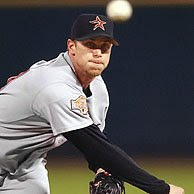 To me, Backe was always the 4th or 5th starter on the Astros team with Roy Oswalt, Roger Clemens, and Andy Pettitte. He's pitching in Texas tonight. He brings with him a 2.44 WHIP and an 12.00 ERA. We're rooting for him, though. On a disturbing note, Backe's top two baseball-reference comparisons are Geremi Gonzalez and Kevin Foster, a couple of former Cubs who had brief success in the Majors but also passed away way before their times. Foster, a converted 3rd baseman, sadly succumbed to cancer last October, and Gonzalez shockingly was struck by lightning a little over a year ago. It's crazy the things you'll find when looking at someone's baseball-reference page. Like we said, we're rooting for Brandon Backe. It just feels like Ian Kinsler, Michael Young, Hank Blalock, and Nelson Cruz can't wait to get into the batters box. Since the Cubbies already took care of business today, with a thrilling victory over their crosstown rivals, I feel fine saying, for tonight: Go Astros! 2 homers surrendered in the first two innings...good to see he is fully back! Check it out...Zobrist #2 in OPS now that he has enough at-bats.